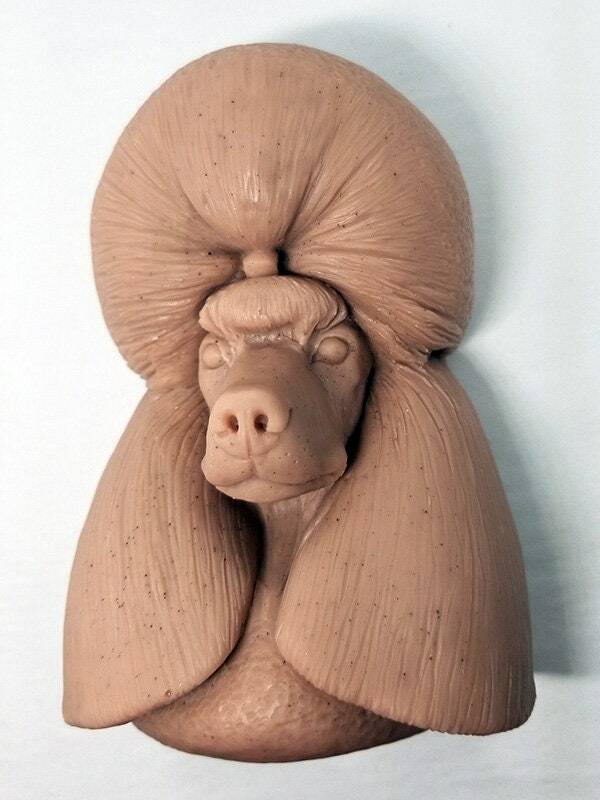 This regal looking Poodle Soap is favored by owners, breeders and dog show judges alike. It will stand proud in any bathroom, kitchen or display shelf. As shown here in the color DARK GREY, it looks more like and ancient artifact than a bar of soap. Please read my full product description before ordering. For one of a kind experiences, all of our designs are exclusively handmade and sold by Sculpturesoap. My creative process begins with a pencil sketch and the design is refined in clay during the modeling phase. The final soap product faithfully captures the subtlest impressions of the original sculpture. Sculpturesoaps are made to delight, perform great, and to last. Although use is always optional, the deep details in the sculpt linger after multiple uses. If it is to be enjoyed instead as a decorative element, a Sculpturesoap has a long shelf-life of 3+ years. Every design is available in up to a dozen color and scent combinations. For a full list, see below. Each soap will vary slightly in color, speckles and edge detail because of our unique and extensive handmade process. Two different soap formulas available. 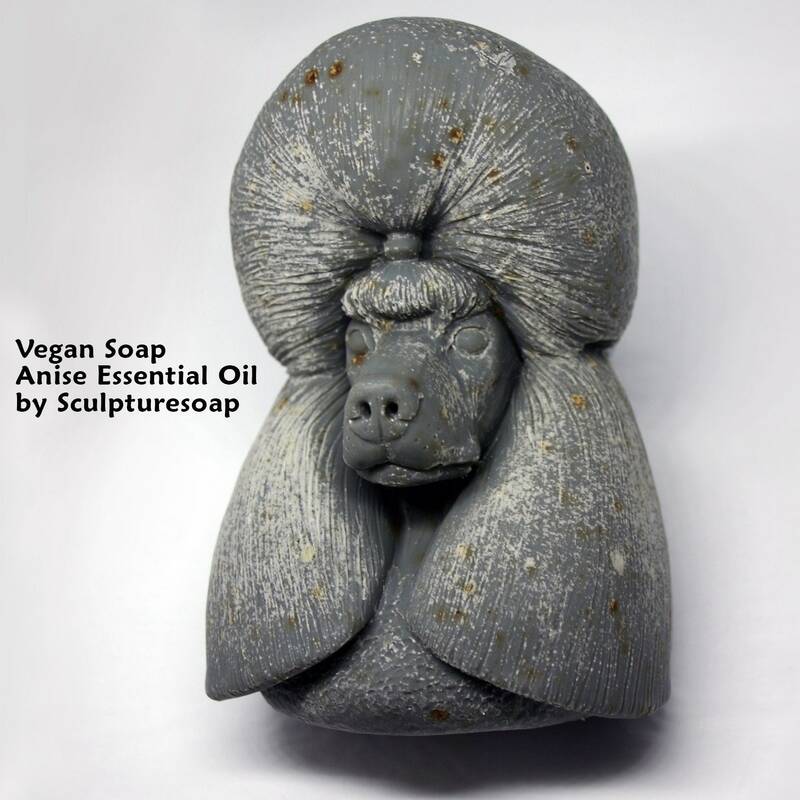 VEGAN SOAP BASE (V) - I proudly blend essential oils with responsibly sourced organic vegetable oils. Ingredients are organic coconut oil (cold pressed unrefined), extra virgin olive oil, organic hempseed oil, purified water, and is naturally colored with clay, charcoal, or grounded seeds. Consider this soap base especially for DELICATE AND SENSITIVE SKIN. It does not contain any animal or artificially made products consisting of chemical compounds. It has no preservatives, no additives, and no synthetic colorants. To maximize longevity, use it at any time after 3 weeks from the posted manuf. date. ART WITH BENEFITS - Ingredients are coconut, palm, and safflower oils, glycerin (kosher, of vegetable origin), sorbitol, sorbitan oleate, soybean protein, titanium dioxide. These vegetable oils make it smooth and creamy to use, while achieving a frothy lather. To enhance your bathing experience, delight your senses, and compliment the intricate design, a mineral oxide pigment is added for color along with a fragrance oil. This low sweat formula helps eliminate “glycerin dew” that can occur in high humidity environments. And, as with all soap bar products, it may shrink a bit due to moisture lost when not in use. This soap bar is 3" wide, 4.5" long and 3" high. The packaged item weighs 10.5 ounces. All Sculpturesoaps are packaged in a corresponding gift box that has a window on top for product viewing and is stamped with color and scent information for that item.